With an intense craving to find the last pieces of the puzzle, Izzie Trapped in a tedious job without fulfilment, ambitions, or a boyfriend, Izzie Murray’s only passion is researching her ancestry. But the beautiful mural of her family tree switches from a distraction to an obsession once she hits a mysterious gap in the timeline. Why would an entire family just disappear? To ask other readers questions about The Missing Branch, please sign up. This is a short story, but one very well done. The protagonist, Izzie, is great, and I love the role that her search for her ancestries plays in the story. It's interesting that she knows, as soon as she arrives at Bulwark, that something is not wrong, but weird. How there are things, places and people who are compelling and other ones that feel antagonists. I was really engaged with the characters, and most certainly want to know more of this Universe. The missing Branch is the 5th book in the Bulwark Anthology series. It was a very quick stand-alone read that is a great addition to the rest of the series. MacLeod does an incredible job developing her characters and storyline within the context of this short novel. It was well paced. I could not put it down! I highly recommend this book! With an intense craving to find the last pieces of the puzzle, Izzie ditches her life in England to investigate the last known whereabouts of the family - the little town of Bulwark, Georgia. B Trapped in a tedious job without fulfillment, ambitions, or a boyfriend, Izzie Murray’s only passion is researching her ancestry. But the beautiful mural of her family tree switches from a distraction to an obsession once she hits a mysterious gap in the timeline. Why would an entire family just disappear? The missing Branch is the 5th book in the Bulwark Anthology series. This is a short story, but one very well done; I truly wished it had been longer as it was so good. It was a fast paced read filled with mystery, paranormal and enough clues on the way to raise my hackles - in a good way! The writing was excellent, wonderful characters and developed so well and an ending that had me completely welled up! I can't wait to read the rest of the series and will certainly be reading more from the author. 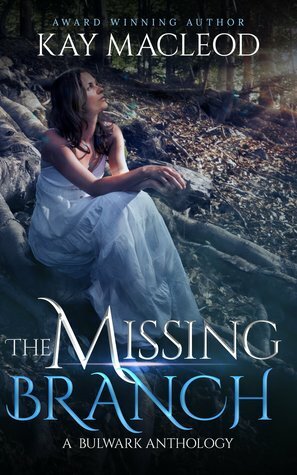 I have just finished reading a Brilliant book called ''The Missing Branch'' by the lovely Kay MacLeod .The story is about a young lady called Izzie who is in search of her family history. Izzie travels far to Bulwark to seek this information - yet everything is not as it seems. ''The Missing Branch'' is part of a the Bulwark Antholgy series, yet this book can be read as a stand alone piece. I especially like how you get to know Izzie and how she is devoted to finding her families history yet the I have just finished reading a Brilliant book called ''The Missing Branch'' by the lovely Kay MacLeod .The story is about a young lady called Izzie who is in search of her family history. Izzie travels far to Bulwark to seek this information - yet everything is not as it seems. I especially like how you get to know Izzie and how she is devoted to finding her families history yet the author shows how Izzie is missing other areas of her life and how she may be linked to a mystical force. The author developed the main characters well, as I felt like I cared for their future and happiness. Towards the end of the book I was really gripped to know more of what happens to the main characters. I hope the author will make a second book. This is the 1st book I've read written Kay MacLeod; she has done a great job at writing a good book; I will definitely be reading more of her books. The story line caught my attention at the very beginning and kept me interested throughout the entire book. I received a free copy of this book via booksprout and I’m voluntarily leaving a review. I really enjoyed this installment of the Bulwark Anthology. It felt like YA but also adult. I need more, the ending was just too abrupt and open to questions. I really liked the authors style. BTW no witches were burned at the stake in England, they were hung. In a twist a from the typical way family is researched, English girl Izzie, who has become fanatical about her family's genealogical research, decides to go to America to trace a missing branch that is creating a bewildering hole in her family's timeline. When she gets to Bulwark, Georgia, something isn't quite right about the place. First, she has an encounter with a wolf near a pool of mysterious green goo. When she rolls into town itself, people aren't open to strangers, and she can't even fi In a twist a from the typical way family is researched, English girl Izzie, who has become fanatical about her family's genealogical research, decides to go to America to trace a missing branch that is creating a bewildering hole in her family's timeline. When she gets to Bulwark, Georgia, something isn't quite right about the place. First, she has an encounter with a wolf near a pool of mysterious green goo. When she rolls into town itself, people aren't open to strangers, and she can't even find a place to stay. She researches intently at the small library there. She meets an interesting young man who is willing to help her on her quest. Meetings with other townspeople don't go so well, and she’s having a hard time getting anybody to talk about her family. Will Izzie find out anything about her family? What's going on in this small town? Will she figure out anything about the strange pool of glue? What about her relationship with Matt? Will their feelings for each other? And how would that work since she lives in England? The author did a good job of creating a very creepy atmosphere for the book. Izzie is a fascinating young woman with a lot of questions that she has a hard time getting answered. This book is tagged as a paranormal romance, but I wouldn't quite call it that as there is no HEA. The book certainly leaves you wondering what exactly happened at the end. It had a slightly *Twilight Zone* feeling to it. If you enjoy creepy paranormal books, this one might be for you. This review has been hidden because it contains spoilers. To view it, click here. The concept of the story was amazing. It was interesting how the story continues after Sheriff Clay encountered the which. Though, I was unsure, because I thought maybe there would be two endings, just like in the first book of the anthology. But I believe this is the continuation on Izzie and Matt's story. You know, this idea reminds me of the Hallmark movies that I would see, except there is a hint of sexual content in there (not a lot, to tell you the truth which is ok). But I was disappointe The concept of the story was amazing. It was interesting how the story continues after Sheriff Clay encountered the which. Though, I was unsure, because I thought maybe there would be two endings, just like in the first book of the anthology. But I believe this is the continuation on Izzie and Matt's story. You know, this idea reminds me of the Hallmark movies that I would see, except there is a hint of sexual content in there (not a lot, to tell you the truth which is ok). But I was disappointed that the ending went abrupt. There was no smooth transition. It felt like it was rushed. But I understand. It's not easy writing a novella with short chapters. Through the years, I’ve always made up stories and took characters on amazi Confession time, I’m a fantasy addict! For as long as I can remember, I’ve loved the concept of magical worlds.